Hi there friends! How are you… hope everything is going wonderfully for you today. 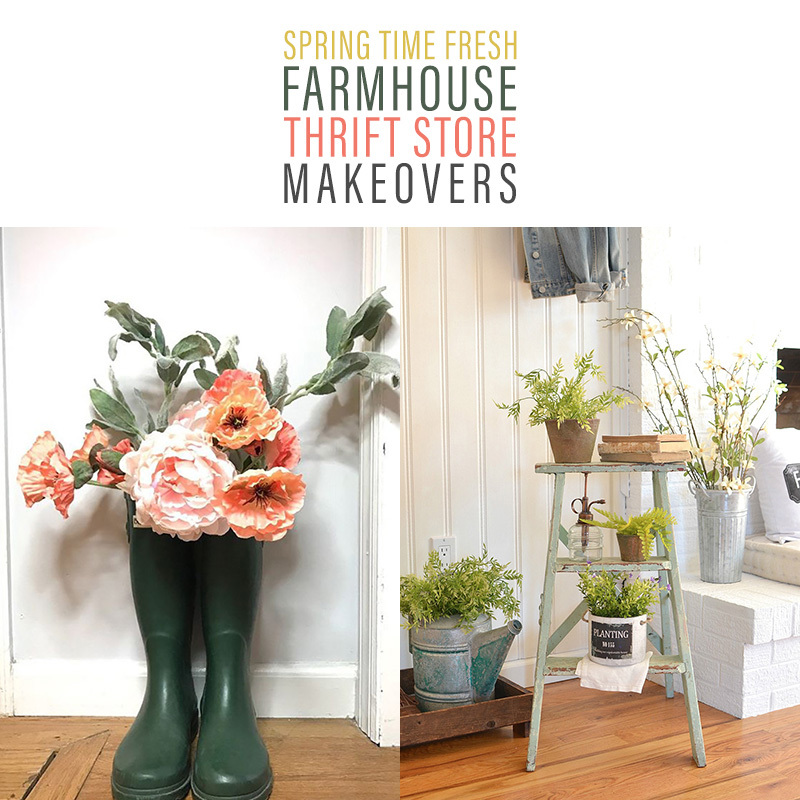 It is once again time for some Spring Time Fresh Farmhouse Thrift Store Makeovers. This weeks selection is so much fun and each and every piece will make your Farmhouse Home Decor Smile. You will find a fabulous Upcycled Window Frame Wall Art Creation… gorgeous Thrifted Drawer Spring Garden… an adorable Repurposed Step Ladder and so much more. So now is the time that you sneak off to the most comfy space in the house with your delicious cup of brew and get tons of inspiration for your next Thrift Store Collection. Sarah over at Sadie Seasongoods decided to finally upcycle an old thrifted window frame that she has had for a long time! She wanted to create a whimsical piece and that is exactly what she did. Come on over and see how it was done. 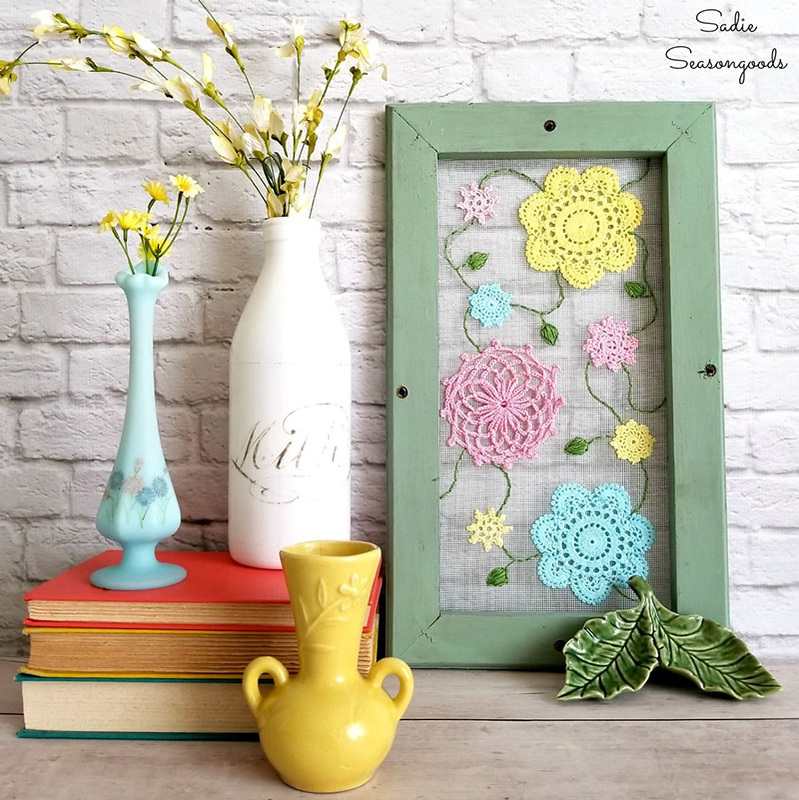 This project will inspire you to find an old window frame or frame of your own and to also search for pretty doilies : ) What a fabulous Cottage Farmhouse look… perfect for Spring and that special touch of Easter. What you create with an old thrifted light fixture??? 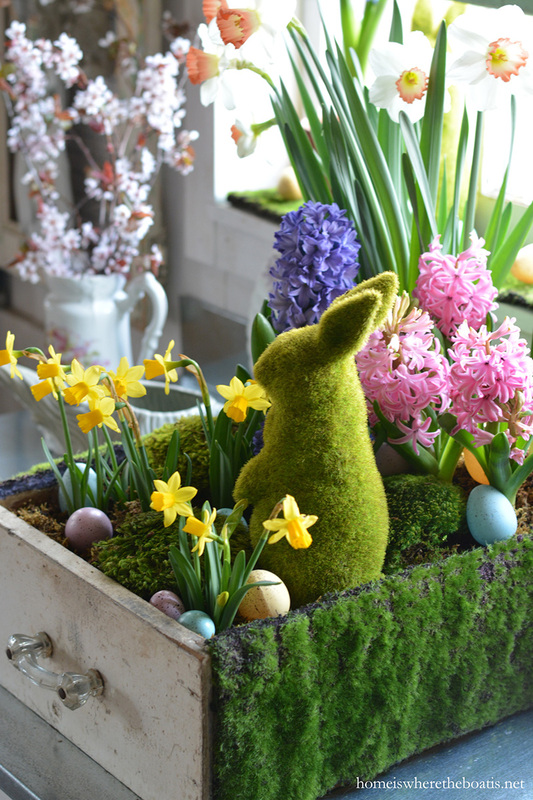 Well the creative Kathy over at Petticoat Junktion decided to turn hers into a whimsical Easter Terrarium! How much fun is this. She shows you exactly what she did so you will be inspired to create one of your own! 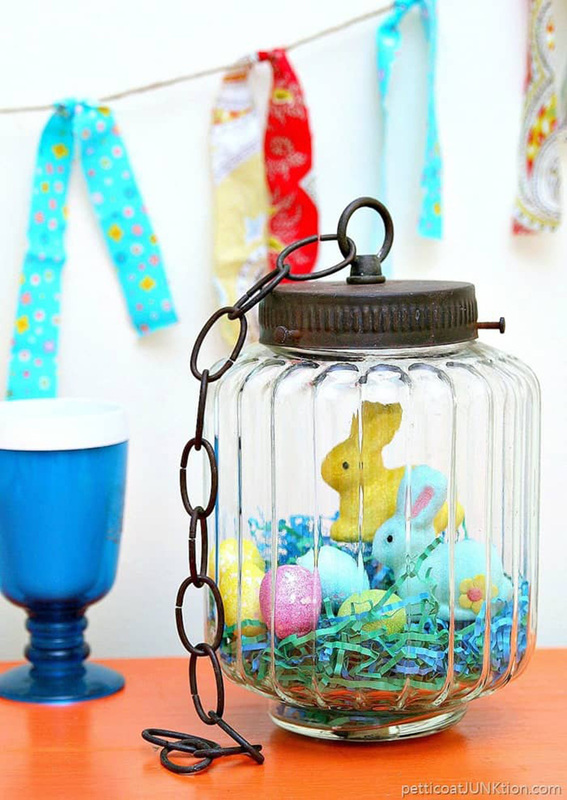 If you can’t find a fixture… keep your eyes peeled for pretty jars with interesting tops or embellish the top too! So many possibilities. 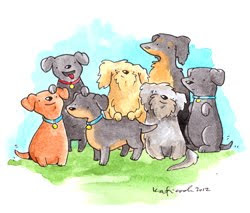 Visit your Thrift Store… walk the aisles and something just might jump into your cart! My heart fluttered when I saw this one… Sarah is always creating such amazing things! 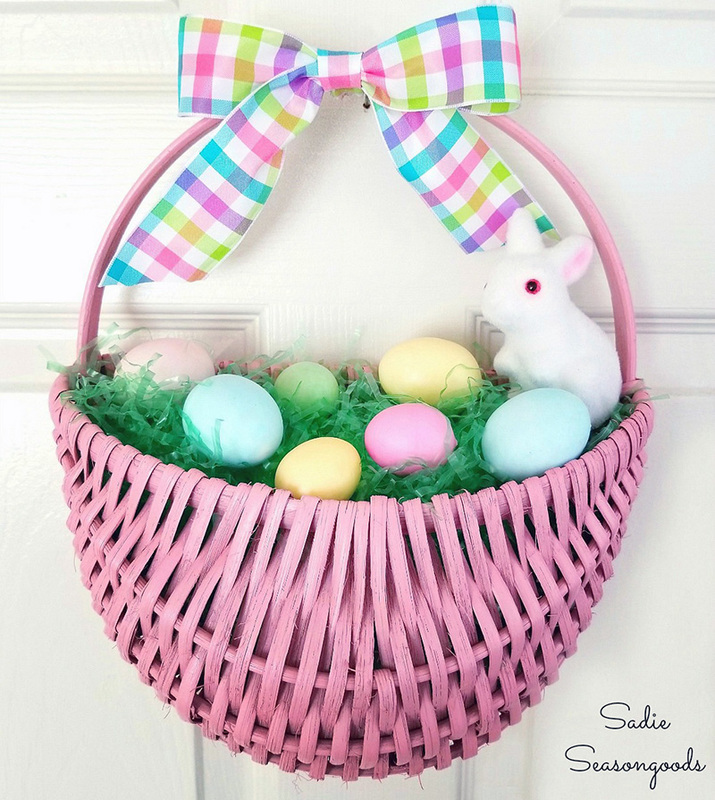 I just love this little Spring Easter Door Basket Wreath! What else is super cool about it is… you can fill with with so many different things. You could paint it a neutral color and change it up for the Seasons. Sarah is sharing her process over at Sadie Seasongoods so you will be prepared when you find your little basket treasure! 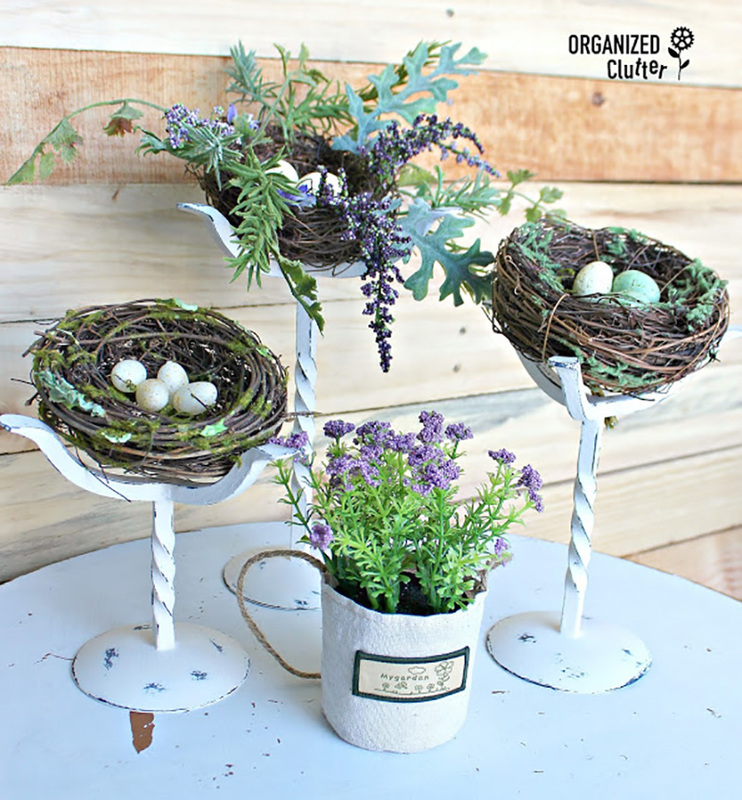 Carlene over at Organized Clutter found some Candle Holders at her local Thrift shop and she turned them into fun and fanciful holders for beautiful little Spring Time Nests! 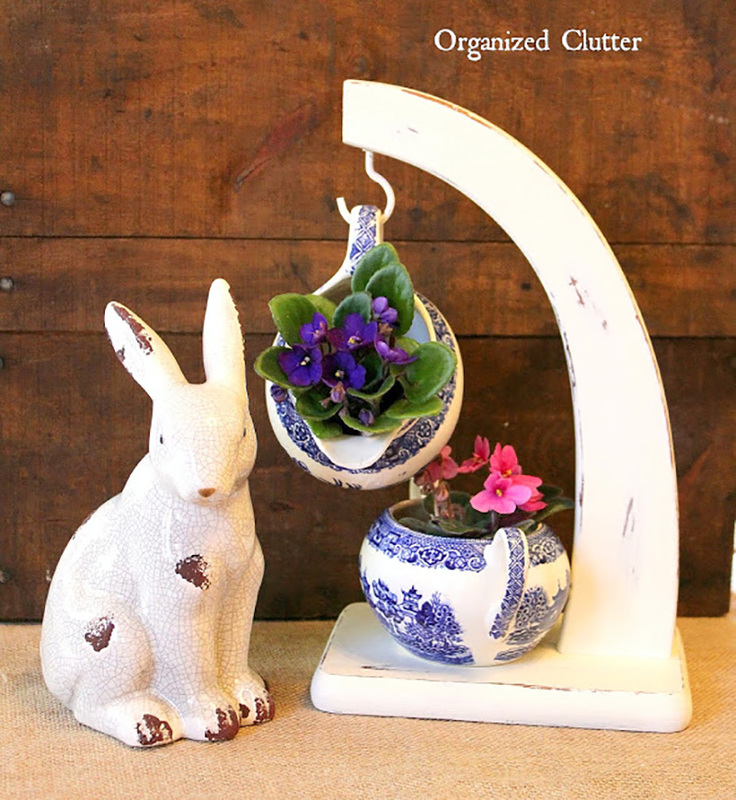 Together along they created the most precious little Vignette that will Welcome Spring! Just shows you what a little bit of paint… distressing and imagination can do! Once Spring is over… she can use them to display other Seasonal creations or just tuck them away until next Spring! Sarah Joy is sharing what she did with her special little find… a shabbied green ladder! 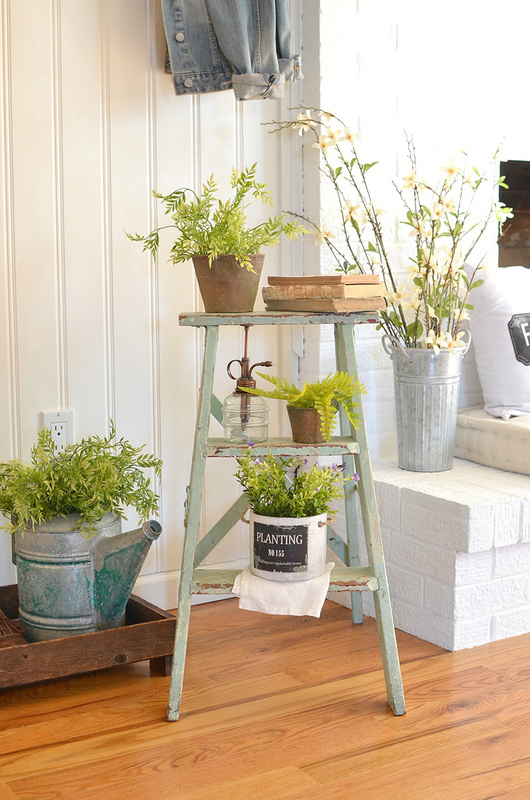 Keep your eyes peeled for little step ladders… they are amazing Farmhouse Accessories! With just a little bit of paint… a bit of distressing or not… you are going to have a real treasure! Just look what Sara created… her display looks like it could be on the cover of Country Living! Drop by this wonderful blog for even more inspiration! This is truly the perfect Spring Time addition to any home! If you are a regular here at The Cottage Market you know that I LOVE upcycled drawer projects. Drawers are everywhere in Thrift Store so it is always fabulous to see them used in so many different way… just like here at Home Is Where The Boat Is! Did you ever think of planting a mini Spring Garden in a thrifted drawer? Well you just might consider it now when you see this Potting Shed Panding Spring Bulb In A Drawer! Come on over to this lovely blog and see how it is done. You are going to be totally inspired! Just think of all the possibilities. You could do all kinds of paint treatments in so many different colors or stain… fill them with all kinds of different plants and embellishments… the possibilities are ENDLESS!!! Thank you thrifted drawers of the world… you truly rock! 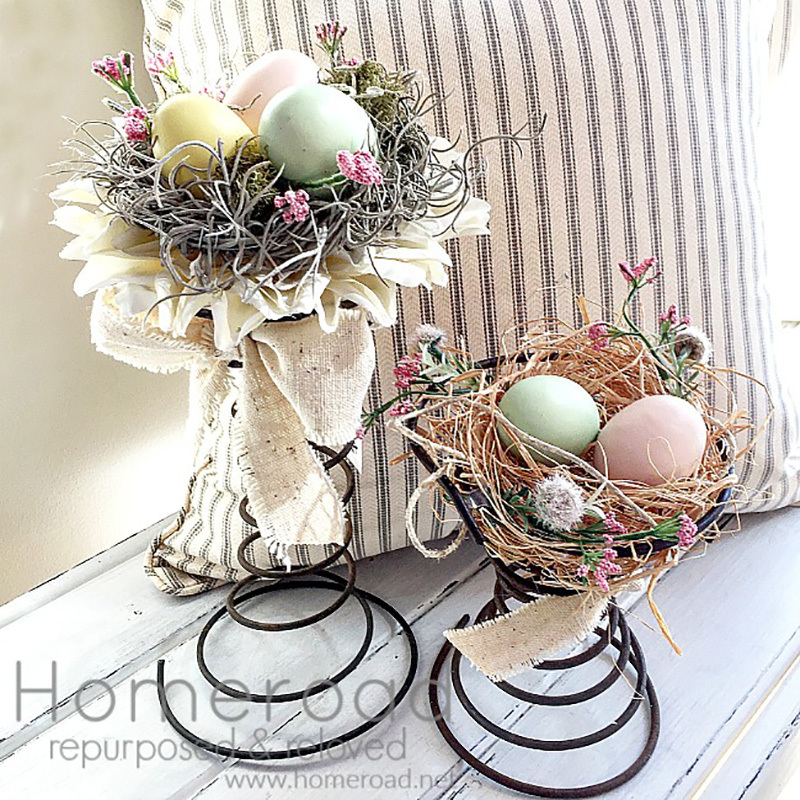 BOING… Susan over at Homeroad had the perfect idea for her Thrifted Vintage Bed Springs… adorn them with beautiful nests and create a gorgeous Farmhouse Spring Time Vignette! 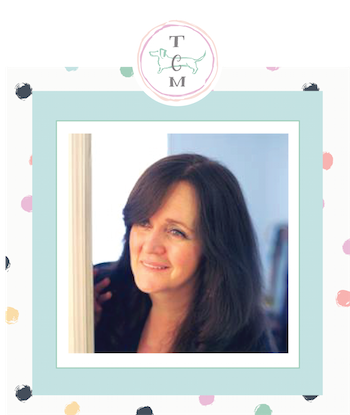 Come and see how she pulls the project together… it’s perfection! Leave it to Larissa to come up with a perfect Easter Celebration Piece! 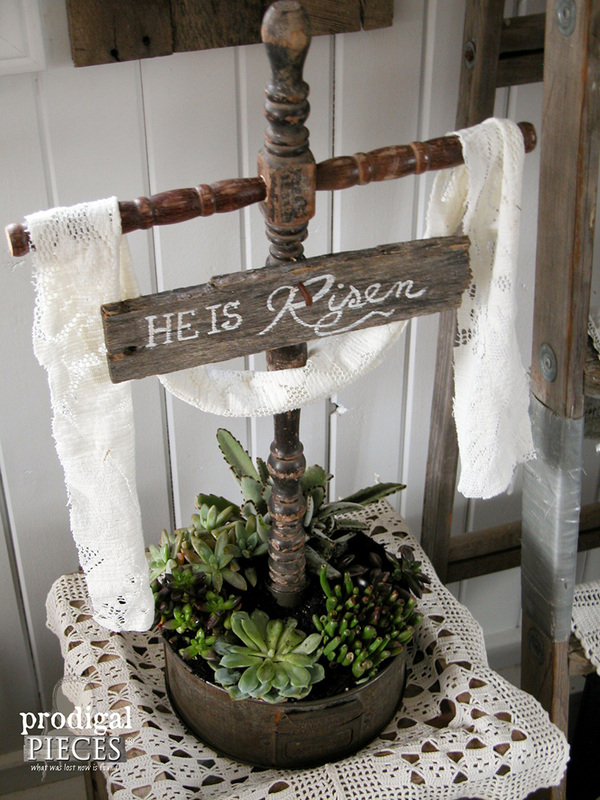 Who knew an accumulation of some odd thrifted pieces could make this beautiful Repurposed Easter Cross. Come on over and check out all of the pieces and how they came together. You never know… you just might have some that you can use to create something like this. Remember… if you have a broken chair and not sure what to do with it… you can harvest it for dowels and legs : ) Be Inspired!!! 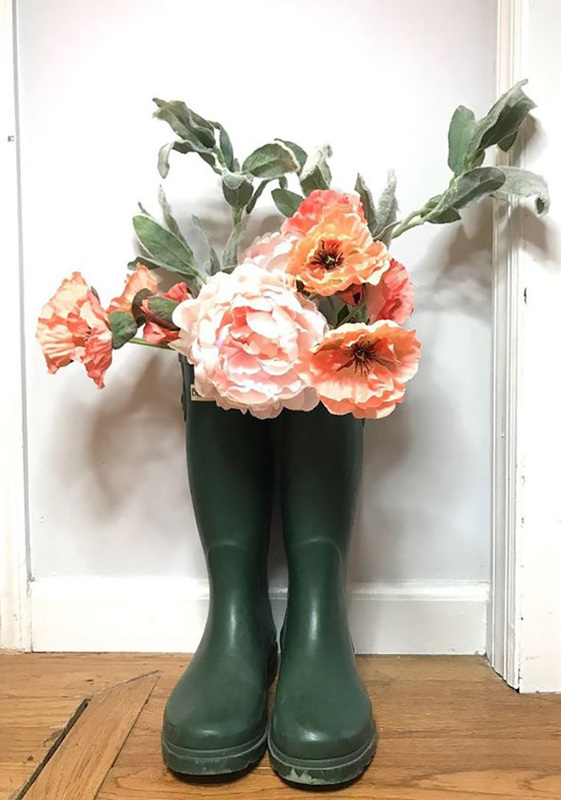 If you happen to run into a pair of rain-boots at the Thrift Store…don’t pass them by! Pick them up and turn them into a fabulous Farmhouse Spring Project…From an awesome Wreath…To a Vase and beyond. Enjoy! Get the details over at Hometalk and start creating!!! Farmhouse Thrift Store Makeover Gallery!